The House of Kamiar Rokni has been working in the fashion field since 2007 and is one of Pakistan’s oldest and leading fashion brands. 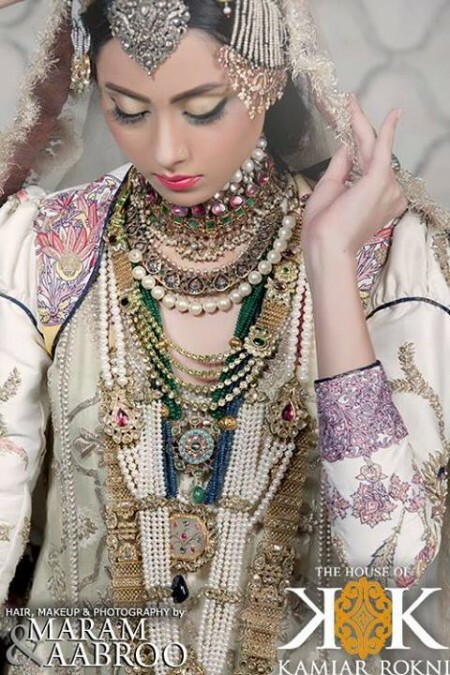 Kamiar Rokni Orientalist collection 2013 for brides has recently launched. The house of Kamiar Rokni has emerged on the fashion screen with the mission to cater women with high quality fabrics, is one of the most demanding and famous fashion label. For every season and occasion, the House of Kamiar Rokni also offers menswear collection. The House of Kamiar Rokni has launched many collections and now another Kamiar Rokni Orientalist collection 2013 for women has launched. You’ll find women dresses, designed according to the latest fashion trend in this collection. With cuts and high ends, every dress of this collection has adorned. This collection has simple stitching styles such as short and long shirts with churidar pajamas, lehangas and trousers. Bright colors like white, red, pink, green etc are used for them. You can also wear them in functions and parties, though these dresses are designed for brides. As having cuts and modernity, so these dresses are perfect for young girls. You can see them here below.